Hollow Fosse is a fictitious location in the south-west of the Cotswolds region. The layout represents a small rural branch line that connects with the former Midland and South Western Junction Railway. After being absorbed into the Great Western Railway (GWR) is still provided a useful link between the midlands and the south coast. Nationalisation allowed the mainline and its branches to settle into the slow rhythm of the countryside that it served. 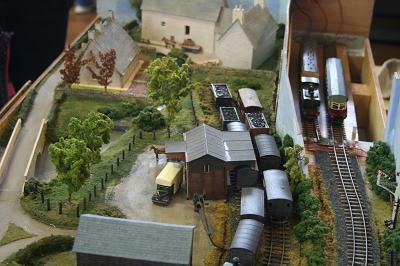 The layout endeavours to recreate the atmosphere of the late 1950's and early 1960's. 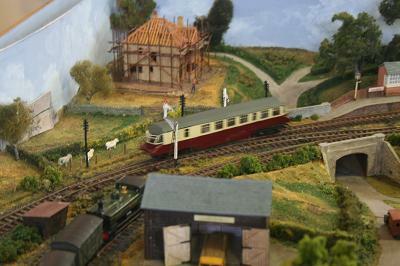 The buildings many of which are modelled on actual structures, depict a typical Cotswold location. Locomotives and rolling stock are still a mixture of previous railway groups, GWR (Western), Southern and Midland including mixed trains which rationalised train movements. The layout which is L shaped has a dimensions of 5 feet by 3 feet and is operated from the rear of the 5 feet length. It is modelled on a 3mm to 1 foot scale, Triang TT.